In the middle ages and earlier, there was nothing to stop things from falling into the house. This posed a real problem in the bedroom where bugs and other droppings could mess up your nice clean bed. Hence, a bed with big posts and a sheet hung over the top afforded protection. That's how canopy beds came into existence. Canopy beds actually date back to 13th century Europe. In most castles and manor houses and in some town dwellings, materials such as wood, clay tiles and stone were used for roofing. All served even better than thatch to "stop things from falling into the house." Poor peasant folk, who were the most likely to suffer the annoyances brought about by an ill-kept thatch roof, commonly slept on straw pallets on the floor or in a loft. They did not have canopy beds to keep out falling dead wasps and rat droppings. Wealthier people didn't need canopies to keep out things that dropped from the roof; yet wealthy people such as noble lords and ladies or prosperous burghers did have beds with canopies and curtains. Why? Because the canopy beds used in medieval England and Europe have their origins in an entirely different domestic situation. In the earliest days of the European castle, the lord and his family slept in the great hall, along with all their servants. The noble family's sleeping area was usually at one end of the hall and was separated from the rest by simple curtains. In time, castle builders constructed separate chambers for the nobility, but though lords and ladies had their bed(s) to themselves, attendants might share the room for convenience and security. For the sake of warmth as well as privacy, the lord's bed was curtained, and his attendants slept on simple pallets on the floor, on trundle beds, or on benches. A knight or lady's bed was large and wood-framed, and its "springs" were interlaced ropes or leather strips upon which a feather mattress would rest. It had sheets, fur coverlets, quilts and pillows, and it could be fairly easily dismantled and transported to other castles when the lord made a tour of his holdings. Originally, curtains were hung from the ceiling, but as the bed evolved, a frame was added to support a canopy, or "tester," from which the curtains hung. Similar beds were welcome additions to town homes, which weren't necessarily warmer than castles. And, as in matters of manners and dress, prosperous town-folk emulated the nobility in the style of furnishings used in their homes." I still want a canopy bed, though. Never had one when I was a little girl and now....well, it's still on my wish list, decades later. Who else out there had one/has one? I had one from the ages of twelve to eighteen and that canopy bed is STILL in my room at Mom's house. It is the typical French provincial canopy style bed with matching dresser and chest of drawers. When I lived at home the canopy was lavender with a matching comforter and pillow shams. Now, the canopy is actually a tatted bedspread my great aunt made. It is gorgeous and the perfect canopy top. It means a lot to me as she used it on her bed for years and willed it to me because I was the only member of the family who could repair the tears in it because I was the only one who learned to tat from her. There is just something so comforting and safe about sleeping in a canopy bed. Thanks for a great and very informative post, Kathrynn! Rat droppings. SHUDDER! Terrific post, Kathrynn. Especially since I'm researching a medieval story now -- it couldn't have come at a better time to jumpstart my imagination. 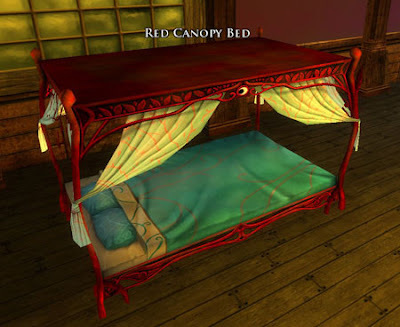 When I was a kid and thought that canopy beds were the most romantic things in the world, I didn't know the reasons for them. Now, my mind jumps to issues of claustrophobia and disease. I bet it got really stuffy in there when the heavy curtains were closed for privacy. And if a person was ill, were they closed in with all that fetid air and kept breathing in their own germs? And yet, when my husband and I go to a B&B, I always want to find the ones that have canopy beds...so I guess the romantic in me has the last word after all! I had a canopy for many years (about ten). FYI: Just be prepared to vacuum the top. Major dust catcher. I got rid of mine because of my allergies, but I loved the thing. Back to lurker again. Great blog. I wanted a canopy bed from a very early age (after reading about them in historical fiction). My mom finally got me one when I was about ten or eleven. Dark wood with a curving canopy (cotton, it could be taken off and washed, I concur with Mary about the dust). I still have it, though I took the canopy frame down years ago and just use it as a four poster.